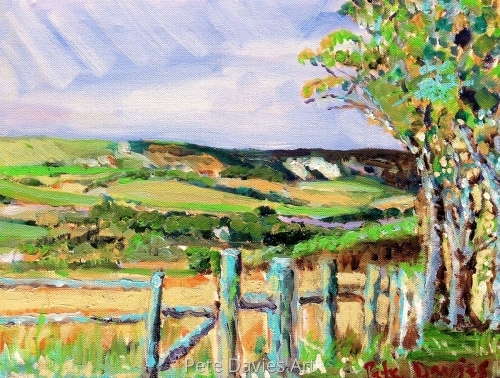 This is a painting of the South Downs looking from Westmeston near Lewes, Sussex. The bright yellow line that snakes down the hill to the gate epitomises the desire felt to get up on the downs to the place where the sun shines brighter. It is a romantic but real vision. I was particularly pleased about the scumbling over the background hills in a blue white, these hills were originally the same colour as the rest of the painting. 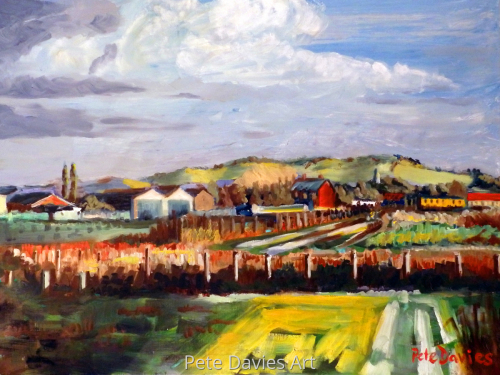 12" x 18"17" x 25.5"19.75" x 29.75"
An oil painting of John's farm which I pass on the way back to my home. 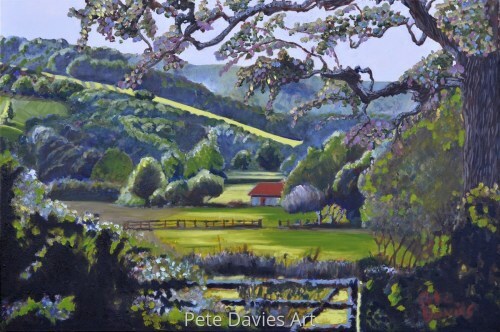 11" x 14.75"17" x 22.75"20" x 26.75"
This painting shows an old trail across the Sussex Downs, used for years by travellers and traders now illuminated in the early Spring sunshine. The first stage of the painting was the underpainting using earth colours such as burnt umber with the brighter colours added on top. It conveys the warmth and optimism of a beautiful day on the downs. 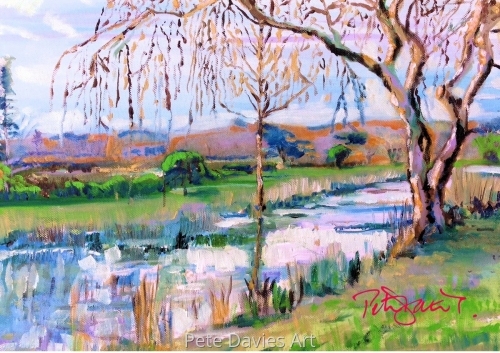 9" x 12"10.75" x 14.25"
This is a view of Steyning, West Sussex painted in March just as the seasons were changing from Winter to Spring. The underpainting was in brown with white high lights. 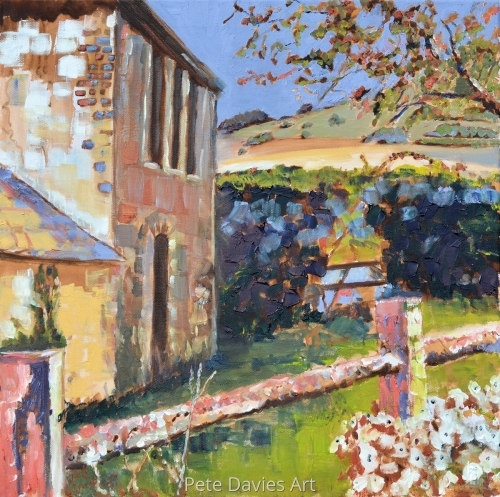 The colours were applied quickly in an impressionistic style so really it's a mixture of styles of painting, the old and the new. I think it represents the rebirth of Spring and hopeful optimism. 11" x 15.5"13" x 18.5"17" x 24"
The West Sussex Downs near Chanctonbury Ring. I've always liked the poster art of the mid 20th century which I think is reflected in this painting. 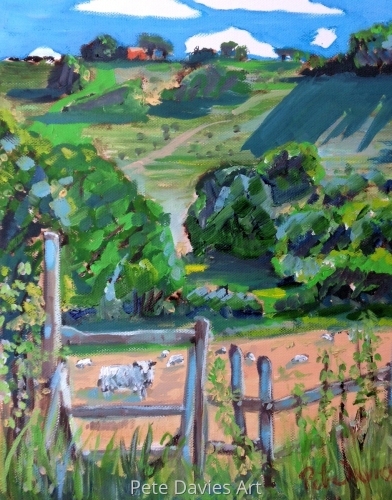 I also enjoyed making the sky a small part of the picture so as to emphasise the height and power of the Sussex Downs. 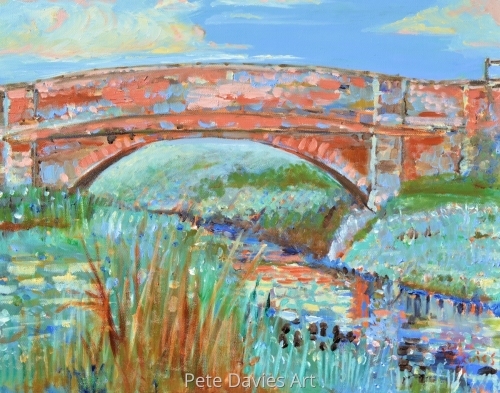 10.25" x 8"11.5" x 9"14" x 11"
A river bridge in East Sussex outside Lewes. 11" x 14"17" x 21.5"20.25" x 25.75"
A house on the Sussex Downs near the Long Man of Wilmington. I particularly like the way the flowers in the right hand corner turned out and the reflection of light on the fence. 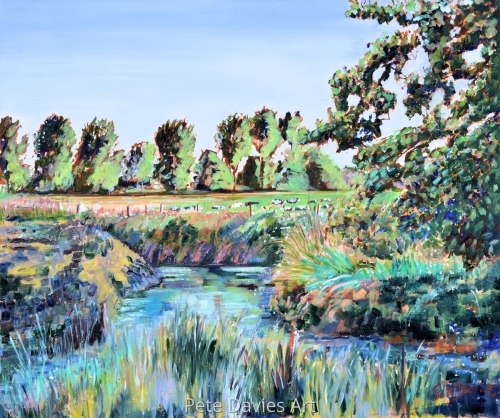 12" x 12"17" x 17"20" x 20"
An oil painting of the farm and stream at the end of the road where we live in west Sussex. Apparently there is a Roman villa about one foot below the soil. 14" x 16.75"17" x 20.25"20.75" x 25"
My wife and I were driving in West Sussex, the rain was But then all of a sudden it did stop and the sun came out. A few moments later we passed over a bridge and I shouted at my wife to stop the car. Grabbing my camera I jumped out just in time to catch the couple sailing sublimely along the river, blissfully ignorant of my intrusion into their private moment. The image sums up the start of life's journey. 18.75" x 14"22.75" x 17"26.75" x 20"
A view of the Downs in West Sussex near where I live. 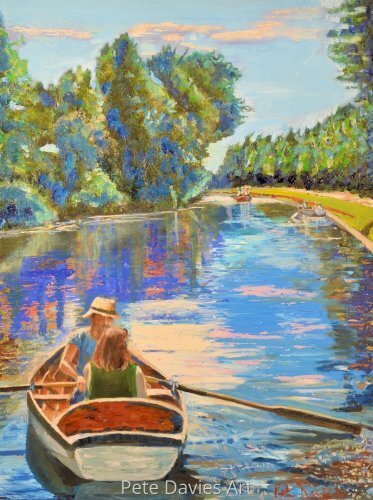 This is one of those paintings that just seemed to work well, it was painted over two days as almost plein air. 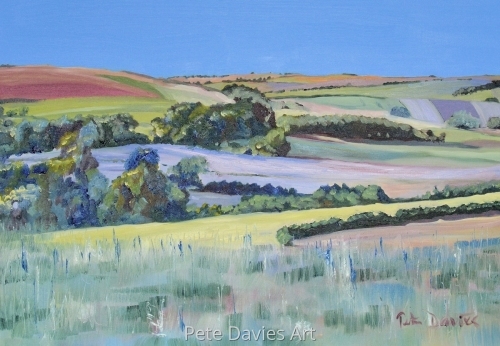 to me it represents the vibrancy and beguiling nature of the downs. 11" x 16"13" x 18.75"13.75" x 19.75"
Everyone who works out of the Shetlands will recognise this image. I prefer seeing it as we sail back in rather than as we leave the coastline! I was pleased with the way this painting turned out. 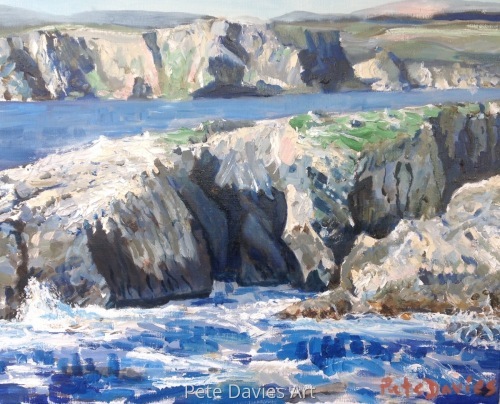 When I started I wasn't sure how I should approach the work but decided it was best to paint it as a grisaille - a method of painting exclusively in shades of grey - although in this instance I used grey and blue. Once I had established the deep shadows I added areas of light using lead white. It took over a week to dry before I could start again. Finally I highlighted the contrast by adding the blues and Browns and touches of light where necessary. 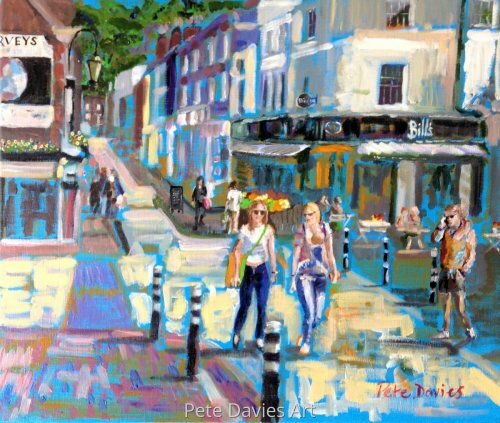 9" x 11.25"12" x 14.75"
This is a painting on linen of the Cliffe High Street, Lewes showing the original Bills restaurant and Harvey's Brewery (a place I worked washing bottles when I was 19). Lewes is the town I was born in, it has changed a lot since I lived there. I wanted to capture the light on the old buildings displaying the vibrancy and liveliness of the town. I hope you enjoy it too. 8" x 9.5"9" x 10.75"11.5" x 13.5"
This is the second of a series of paintings I've made of Lewes in Sussex, the town where I was born. 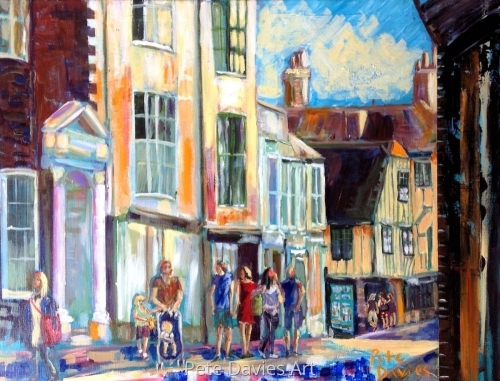 My parents owned a sweet shop on the left hand side of the painting just before the 15 Century bookshop, which is the timber framed building. I tried to capture the vibrancy and brilliance I remembered as a child and which still exists now. A busy, bustling county town. 9" x 11.75"10.75" x 14"